get to meet a young entrepreneur. That he was Ugandan and had recently been awarded in South Africa were the clues. Only two of us in a class of 19 were able to guess. Andrew Mupuya was the young entrepreneur. Before 20th February 2013 I had never heard of this young man. streets. He was from meeting the American Ambassador to Uganda. But as he began to speak, I was in awe. Kampala. He wanted to build the market and the product as well. all his tuition for his degree course in entrepreneurship. class. But I had a weekly timetable and that is how I made it.’ He says. ‘When I started out, I wanted to grow the market. ‘I used to buy paper from Nasser road in Kampala. 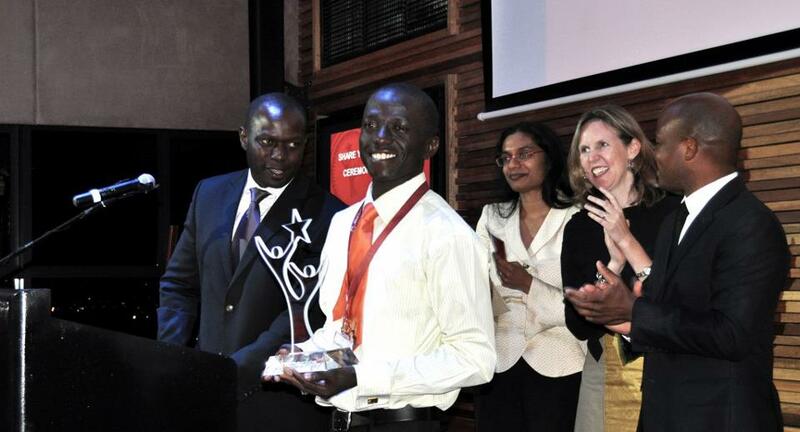 Andrew in Johannesburg after receiving the Anzisha premier award for Africa’s young entrepreneurial leaders in august last year. is what I used to buy furniture. award soon at this year’s European Trade Fair. do not forecast, we do not plan’. So if you want to make it, have a plan and follow the plan however small it is. Thanks for these stories Ruth. They are inspiring and challenging. How are you? Thank you Manzi. I ma well, how are you? wow Ruth, this one moves! In conclusion because We need to Motivate and mentor to so that we substantiate the entrepreneurship mastermind. We Believe that online online business is fun free and worth giving a try in just as we face the economic challenge ahead of us . Hi Kirbie, thank you! You need to start young. So little kids need exupsore to interesting books in their native language or basic English (ie no Halloween books for kids in Uganda). Also, introducing reading to parents so they can share the love of books with their children. Bringing reading and story telling into the classroom, providing access to library books so kids and family members can take them home, and encouraging literacy groups for all ages are also important ways. Since many schools in Uganda have few books, including textbooks, then prioritizing developing a small school library will help (with locally purchased and locally relevant books). And as students get older they need to learn how to navigate the internet too. Finally, and importantly making sure that community members feel welcome in the library and can contribute feedback on good materials to introduce to the library- the library needs to belong to the community members.